Posted by la femme at 3:14 a.m.
What ? Why cannot I have this in Europe ????? have fun !!!! P.S. I do believe in shopping karma, indeed karma of all kinds. All actions are woven into a web of action and reaction, desire and revulsion, plus and minus, good and bad. Karma is the common currency of these charges. And the goal is bliss. P.P.S. Just noticed you will be in YOW. Why? I am there now. Why? Why indeed. I thought you just liked cream colored minis. My Femme would suit you. Is it drawn by cats? A great car! Love it! 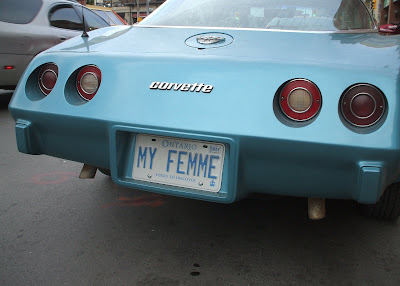 That car *almost* makes me wish I had an Ontario plate instead of a BC one...almost....au revoir!